The earth is hit by cosmic rays all the time. Those with the highest energies collide with atoms already in the upper atmosphere, and produce a cascade of secondary particles, a so-called cosmic ray shower. These secondary cosmic rays include pions (which quickly decay to produce muons, neutrinos and gamma rays), as well as electrons and positrons produced by muon decay and gamma ray interactions with atmospheric atoms. Here, the primary particle was a proton with an energy of 1019 eV, the colors indicate blue: electrons/positrons, cyan: photons, red: neutrons, orange: protons, gray: mesons, green: muons. (Unfortunately, one can't see the colors very clearly, you can decompose the shower into colors on the website. The incoming proton is the line from the upper left, the other upgoing line is cyan and a photon). If you have Quicktime installed, you can also look at this very illustrative movie, which shows the particles cascading down on earth. The above figure has be created using the software SENECA (down-loadable here), the competitor is AIRES, which has a somewhat more impressive advertisement movie (the exact differences between both codes elude me). The number of particles reaching the earth's surface is related to the energy of the cosmic ray that struck the upper atmosphere. 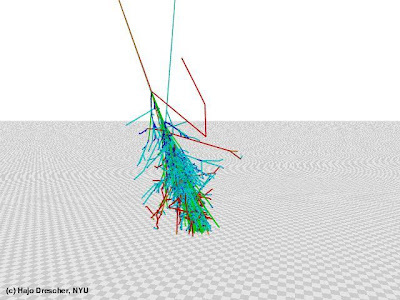 Cosmic rays with energies beyond 1014 eV are studied with large "air shower" arrays of detectors distributed over many square kilometers that sample the particles produced, e.g. at HiRes in Utah, AGASA in Japan and Pierre Auger in Agentinia, the latter has a very nice homepage, summarizing the mysteries that still need to be solved. Energies over 1014 eV sounds extremely large. In comparison, the collision energy that the LHC will reach is 1013 eV. However, one has to keep in mind that in cosmic ray events the energy is typically that of the incoming particle in the earth rest frame and not actually the collision energy in the center of mass frame (LHC collides two beams head on, thus the lab frame is identical to the center of mass frame). To give you an example, the energy in the center of mass frame of an incoming proton with an already extremely high (and rare) energy of 1017 eV hitting a proton in rest is roughly the square-root of 1017 eV times the proton rest-mass, 109 eV, which is approx 1013 eV and comparable to LHC energies. However, one has to keep in mind that cosmic ray events, despite their potentially large energy, are far less in control and attached with higher uncertainties than collider experiments. Most of the air showers are believed to be created by protons. Since the incoming directions are evenly distributed (and inside our galaxy no mechanism is known to accelerate them to these high energies) the proton's origin is most likely not in our galaxy. That means the protons must have travelled at least roughly 50 Mpc  before they reach earth. Now, if the incoming proton's energy increases further, then eventually it will not only react with our atmosphere, but also with the photons in the cosmic microwave background (CMB). That is, for photons with sufficiently high energies, the universe will stop being transparent. The protons will start to scatter on the photons in the microwave background, loose energy and can't reach earth any more. The first reaction that can take place with increasing energy is photo-pion production which happens at a center of mass energy of roughly 200 MeV. This pion production is extremely well measured in earth's laboratories, where photons are scattered on nuclei in rest. If one sets the energy of the photon to be that of the CMB temperature (3 K is approximately 2.5 10-4 eV), one finds that the proton needs an energy of roughly 1021 eV to cross the threshold for pion production. (It is roughly (200 MeV)2 divided by the photon's energy). 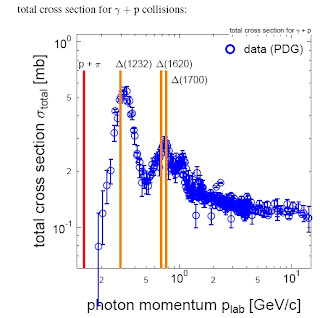 The figure to the left (credits go to Stefan) shows the cross-section for photon-proton scattering in the laboratory (proton in rest), the blue dots are data from the particle data booklet. The red line indicates the initial threshold for the process to take place, the orange lines are the delta resonances where the cross-section has peaks. However, what one actually wants to know is when the mean free path of the protons drops below typically 50 Mpc. 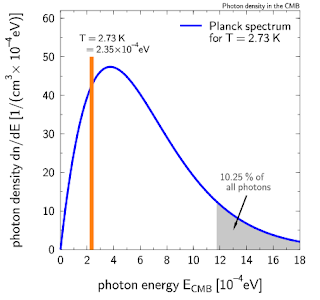 To get a better result than the above estimate one has to take into account that the CMB has a small percentage of photons with larger energy than the temperature, the distribution given by the Planck spectrum. Such, the mean free path of the protons drops significantly already at a somewhat smaller energy than the above 1021 eV because the proton has a chance to hit the higher energetic photons. My husband, as usual, has made a lot of effort to answer my yesterday's question and produced the figure to the right, which very nicely illustrates that indeed roughly 10% of the photons have energies five times larger than the background temperature. c) The assumption that the cross-section (a Lorentz scalar itself) can be boosted from the earth laboratory (proton in rest) into the rest-frame of the CMB (photon in rest). Now AGASA claimed to have observed cosmic ray events with energies above this cut-off (see e.g. Has the GZK suppression been discovered, by Bahcall and Waxman). This has lead to a significant amount of speculation how this could be explained. One of the explanations for example is that a violation or deformation of Lorentz invariance might be the cause for a shift in this threshold, which has been argued to be a signature for quantum gravity (see e.g. Alfaro and Palma, Loop quantum gravity corrections and cosmic ray decays, hep-th/0208193). I have explained previously that I find these explanations implausible - as mentioned above, the energy in the center of mass frame is somewhere around a GeV, now could please somebody explain me why on earth (pun intended) you'd expect quantum gravitational effects in that energy range? One should also keep in mind, that HiRes on the other hand has observed the cutoff where it is supposed to be. Their new data analysis again confirms the cutoff. The recent paper is here, and last month there was a brief article in Physics Today "Fluorescence Telescopes Observe the Predicted Ultrahigh-Energy Cutoff of the Cosmic-Ray Spectrum" by Betram Schwarzschild. It is expected that Pierre Auger will present first results at the 30iest International Cosmic Ray Conference, which will take place in Merida, Yucatan, Mexico from July 3 - 11, 2007. Hopefully, the situation will be clarified then. 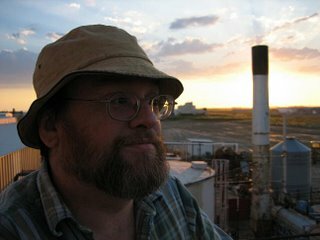 I too am on my way to Mexico, to another conference, the Loops 2007.
: Mpc means Mega parsec. Mega is 106, one parsec is approx 3 lightyears. : Kenneth I. Greisen, Cornell professor emeritus of physics and a pioneer in the study of cosmic rays, died March 17 2007 at age 89. Helicity in an ultra-relativistic fermion is observed strict chirality. Lorentz invariance breaks within a mass sector chiral vacuum background. Are the incoming depleted protons of a single chirality (polarized)? "Now AGASA claimed to have observed cosmic ray events with energies above this cut-off"
AGASA's energy measurements depend on assumptions about particle showers. Because of the way they measure energy, if a shower is spread out in time it will spoof their energy measurement in exactly the observed direction. In addition to excessive energies, AGASA also tends to find correlations in UHECR sources with local black holes that HiRes does not see. There is also a Russian cosmic ray experiment (Yakutsk) that measures energies and gets arrival direction correlations similar to AGASA. It measures energy with an RC time constant circuit similar to that of AGASA. And then there is also the strange results of the mid energy level cosmic ray emulsion experiments. We all know to expect wonderful things to happen at energies higher than we have carefully explored before. UHECR phenomenology should be something that all particle theorists watch carefully. Two years ago I noted that the above odd behaviors are explained if some of the shower primaries are tachyons. Since then, the conventional explanations for AGASA's weird data have not been verified, and the Yakutsk data has added to the weight of evidence. If you don't want to believe in tachyons, then you can explain the AGASA / Yakutsk behavior by late arriving shower particles. But these, still, need an explanation. yes, I meant to write a line about Yakutsk as well, but their website was constantly down, and I found the experiment rather badly referenced (but their data is mentioned in the Bahcall paper I referenced). What are the exotic processes at 50+ Mpc that accelerate protons to 10^19 ev that do not occur in our galaxy or its neighborhood? Also good to note a violation of the Copernican principle. Our neighborhood is special in not have these proton accelerators. Bea, you've enthused me to write up a blog post (maybe later today) on the AGASA and Yakutsk anomalies from an electrical engineering point of view (i.e. how the energy measurements are made). When someone points out anomalies that could be due to inaccuracies in special relativity that appear at gamma factors of 10^8 to 10^11, it doesn't make a lot of sense to use experimental results at gamma factors of 10^4 and special relativity to argue that the anomalies at higher gamma factors do not exist. Which reminds me, did you do a post on doubly special relativity? I like these simple energy estimates :-), and the simulation movies are great! Thanks that you found the plots helpful :-)... I am quite fascinated that some standard nuclear phyiscs stuff of the 1960s (here: photo-pionproduction) gets so important for the propagation ultra-high energy cosmic rays, just because there is the CMB. There are so many oders of magnitude of energy in between, which get bridged by the Lorentz boosts. concerning tachyons or Lorentz-violation as possible explanations of (hypothetical) trans-GKZ cosmic ray events, there is another possibility which may be less exotic: strangelets. As far as I know, no one has so far detected one, but at least they would not require any "new" physics, since they could fit comfortably in the schemes of QCD and nuclear physics. Concerning the possible violations of Lorentz transformations when boosting form the proton at rest in the lab in an photo-pionproduction experiment to the frame of an incoming UHECR proton - would that not imply that the our "local rest frame", say the frame of our comoving Hubble flow as indicated by the CMB, would be special? Would that be a problem for the principle of relativity? Good questions - I do not know, and I am not sure what is known about this at all... I guess possible sources violent enough to produce the highest initial cosmic ray energies such as active galactic nuclei or whatever would look suspicious also in all kind of other signatures, gamma-ray, x-ray, radio,... , so nothing fitting is known in our Milky way. M87, with an active galactic nucleus is 16 Mpc away. I think what I'm trying to get at (I'm confuzzled enough) is that either sparse sources of very high energy cosmic rays are somewhat isotropically distributed in our 50 Mpc cosmic neighborhood (or so dim as to not upset isotropy) or else these cosmic rays are indeed coming from truly cosmic distances. I don't suppose weak intergalactic magnetic fields could isotropize these protons? exhaustive and interesting post as always. I wonder, how do we know that the highest energy cosmic rays aren't heavy ions ? They would sidestep the cutoff since the cross section with CMB grows less than the ion mass as you add nucleons. If one assumes heavy ions as UHECR particles, a total energy of say 10^21 eV can be reached while the energy per nucleon stays below 10^19 eV, thus below the GZK cutoff - but are you sure that the cross section with CMB grows less than the ion mass as you add nucleons? "Would that be a problem for the principle of relativity?" 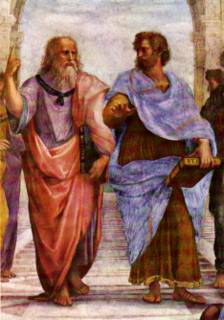 People who talk about making some small change to the foundations of physics, (i.e. DSR) I think are naive in that they do not realize how tightly woven together the principles are. To write physics without the special theory of relativity means to write a completely new physics from the bottom up. If the special theory of relativity is wrong, then so is pretty much every other portion of the foundations. For that reason, I can't tell you in a blog comment why you (physically) should suppose that relativity could be wrong. You would need a year long graduate class on the subject. I can, at best, give sociological reasons for you to imagine this: Look at what David Bohm says about relativity in chapter 12 of "The Unidivided Universe". Also, I wrote up the EE analysis of the problems with the energy measurement at AGASA and Yakutsk over on my and even added a circuit diagram. I think that right now only I see the evidence for tachyons there. The rest of you will explain this as some sort of mysterious late particles, which I think is better than just assuming that the Japanese and Russians can't measure energy. M87, with an active galactic nucleus is 16 Mpc away. but then you would need qite a lot of sources to mimic the observed isotropy? thank you for the link to you post! I'll have a look at it! There are a lot of subtleties involved in this business, since you can't measure the incomming particle's energy directly. But neutal particles? OK, they are not deflected by magnetic fields - but how are they accelerated in the first place? Stefan, sorry, I see that blogger has once again ruined a carefully crafted comment. That was supposed to be a link to astro-ph/0612359, one of several articles pointing out the problem with excessive correlations in UHECRs implying neutral primaries. As to how one accelerates neutral particles, from my point of view this is a problem for standard physics, not for mine. I believe that quarks and leptons are made up of tachyonic preons, and that black holes naturally spew them forth as Hawking radiation. I predicted that the UHECRs would turn out to be tachyonic neutrals 2 years ago. Physics is so tightly interwoven that one heretical idea is never enough. If you swallow one, and follow the consequences (a task which takes years), you end up dividing yourself completely from the mainstream in pretty much every assumption. You end up with a bunch of self-reinforcing beliefs (delusions), each of which is sort of perpendicular to the mainstream beliefs (delusions), though they share the same mathematics. As one (mild) example among very many, I see the Wick rotated version of QFT as the correct description of reality, and the usual QFT as a mathematical convenience. This is pretty much the reverse of the standard view. But to explain this I would have to go through another dozen heresies. This is part of the contiunng process that one seeks to place in order of the research of high energy particle collisions. In it's own natural state, our modern research had to make sense on this natural level. I like the use of color to assist in visualization. The neutrino leaves "bluish streaks of light called Cherenkov radiation" in the Super-Kamiokande detectors. concerning the energy loss of an UHECR travelling through space filled with CMB photons, I've found a recent paper "On the ultra-high energy cosmic ray horizon" by D. Harari, S. Mollerach, and E. Roulet, arXiv:astro-ph/0609294v2. Figures 1 and 3 show the attenuation lengths in Mpc versus energy for protons and three different nuclei, respectively. The attenuation length is the distance a particle with a certain energy would travel before having lost all its energy if the rate of energy loss would not change with decreasing energy. This is of course not the true distance the particle will travel, since the energy loss can change drastically with energy, but since the energy loss usually decreases with decreasing energy, it is a good lower bound for the maximal travel distance. Gamma ray spallation should break up most heavy ions in that energy range as they interact with the CMB. High-energy protons are high energy because they are moving fast. With respect to what exactly? I don't understand how the photons in the background radiation can measure any absolute energy level in the "high-energy" protons. Photons don't define a reference frame. Please advise! Ever heard of of planet Eris?